I have a Sony Vaio Windows 8 T Series laptop and if you’re a Windows 8 user – you will agree that some of the settings are hard to understand. They really are! I was very uncomfortable with my Vaio touchpad, which used to keep switching apps upon touch of a finger, however light the touch. Those who have fat fingers like me will be able to identify themselves with me in a similar situation. Finding a solution was not easy either because I was confused whether the cause of the issue is Windows 8 or it is Sony Vaio. Finally I figured it out and hopefully you will find this article useful. Those new to Vaio will be rather pleased or surprised to know that Vaio has its own settings which replace some of the features of Windows 8. For example, try searching for stop vaio touchpad scrolling and you will get plenty of Google answers, which will refer you to go to “PC Settings,” only you don’t have a “PC Settings” option on a Sony Vaio! 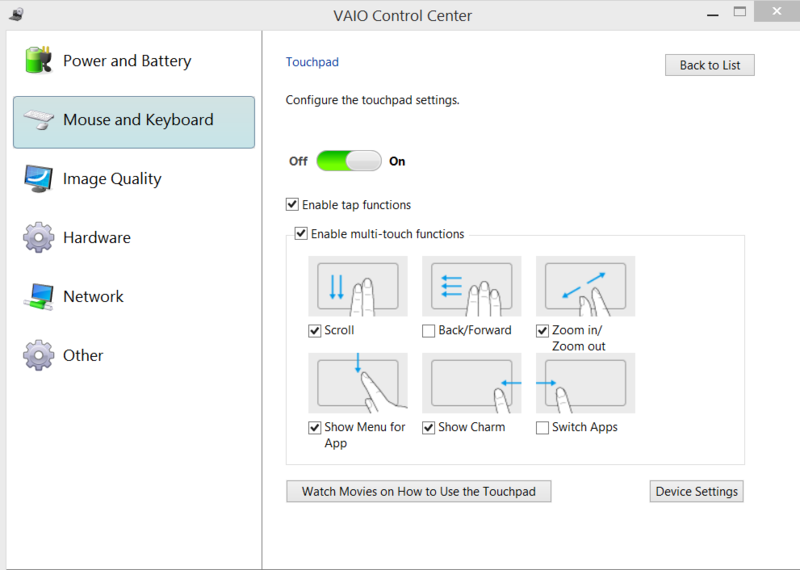 Here’s a solution to change Sony Vaio TouchPad Settings to adjust to your needs and make the laptop work for you. In TouchPad Operations, change the settings to suit your needs. For example, in my case, I disabled the option to switch apps by swiping to the right. If you’re not sure how a feature works, you can click “Watch Movies on How to USe the TouchPad” and understand how a particular feature works and decide how to make it work for you!